Sherkhan Farnood - aka Haram Khor - was born to an admittedly poor family in Afghanistan in 1961, specifically the Jamanchi Village, Khana Bad district, Kunduz Province. He worked his way out of poverty, obtained an education, and started a business in Moscow, Russia. Eventually, business transactions brought him back to Kabul, where he worked his way to becoming the Chairman of Kabul Bank, the largest financial institution in Afghanistan. He is a world class poker player. 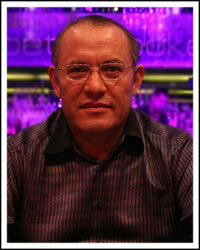 His poker career began as a leisure activity in 2002, but Farnood quickly found success at the poker tournament tables. Final tables at small series in Helsinki led to his first win in Velden at the Worthersee Trophy series. By 2003, he had wins in two events at the Crown Australasian Poker Championships in Melbourne, at the Autumn Tournament in Paris, and the Midland Masters in Walsall. He final tabled events at the 2005 and 2006 World Series of Poker, as well as the 2007 WSOP Europe in London, and in 2008, he won the WSOPE £2,500 HORSE tournament in London for a gold bracelet. In total, he accumulated more than $625K in several years of tournament play. But Farnood found himself in trouble in 2010 when he was accused of being involved in bad real estate deals in the UAE and unsubstantiated loans. He was forced to resign his position at Kabul Bank, and he was put under house arrest until he could be tried for the accused crimes. As of 2011, his house arrest in Afghanistan prohibited him from visiting his villas in Dubai, traveling, or playing poker tournaments. Farnood spent time in Moscow in the 1980s, running businesses that occasionally ran afoul of the criminal underworld. Farnood used to run hawalas, the regulation-free money exchange systems found all over South Asia. Five planes were bought for Pamir Airways by Farnood (principal shareholder of the Airline) in 2009 for $54m – apparently after no discussion with Ferozi – in blatant disregard for the country's banking laws that bans direct investment in non-banking companies. 2010 one of Pamir's ancient Antonov planes, later discovered to be flying under fake documentation, came down in the mountains of Afghanistan, killing all on board. A secret ledger of the actual state of Kabul bank was kept by Farnood, Mahmood Ghazi, the new Chairman says. There were other factors at work that stopped the truth about Kabul Bank from coming out, principally the problem of an ethnic Pashtun having to keep the Tajiks, the country's second biggest ethnic group, happy. Despite having some Pashtun shareholders, Kabul Bank was a cornerstone of the Tajik establishment of northern Afghanistan, with close ties to top warlords, including Marshal Fahim, whom Karzai chose – to the consternation of the UN – to be his vice-president in 2009. Fahim's brother and family received at least $78m in Kabul Bank loans, according to figures provided by Ghazi. According to a US official, Fahim vowed, during the fight to prevent the bank being taken over by the government, never to allow it be "taken over by the Pashtuns". Farnood says he only spent $17m of Kabul Bank's money on Gulbahar Centre, a giant building of shops and unfinished apartments although Ferozi cheerfully told John Boone (The Guardian) it was $35m.